Placed in the wrong position, they can be a menace for pedestrians and road users. Especially visually impaired pedestrians. 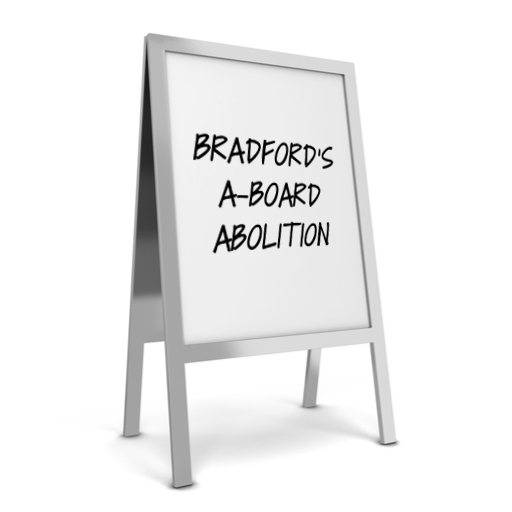 Last week, Bradford City Council voted to ban A-boards throughout its boundaries. Following a free vote on the issue, last week’s result was welcomed by disability campaigners. A licensing solution had been rejected. A-boards ban bad for business? Ulverston Town Council have considered the idea of restricting A-boards. Instead of a total ban, the Cumbrian town have agreed to consult traders on a possible restriction. As with Bradford City Council, they too have cited mobility issues as a factor.